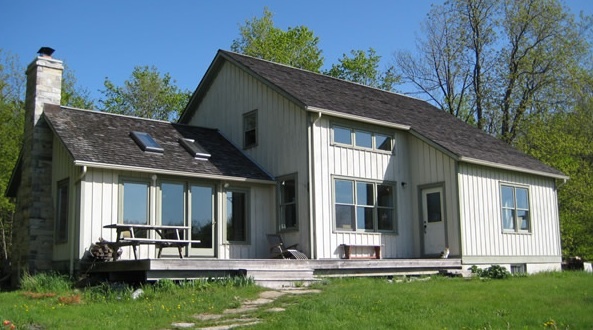 Recently I visited my cousins in Canada, and stayed in a beautiful wooden house deep in the woods near Kingston. It had a big veranda out front and lots of fine woodwork inside, from the kitchen cupboards to the many beams holding up the ceiling. 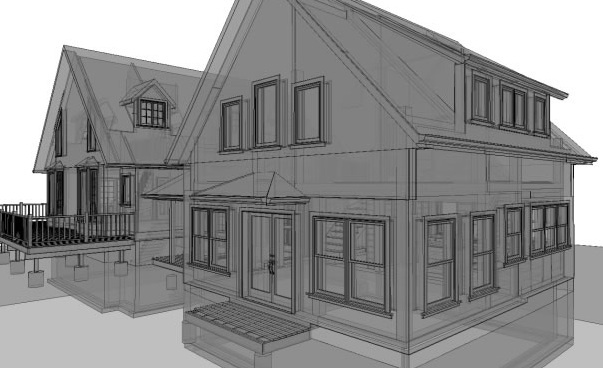 I have always thought it would be fantastic to design my own house. Mine would have lots of windows and be eco-friendly with recycled water and solar panels. As well as stairs, I might put in a curving slide (my son would like that) and I would design my own furniture too, with wacky bunk beds and basket chairs suspended from the ceiling. But it’s not easy to build your own house, especially if you live in a big city as I do. First you have to buy a plot of land, and get permission to build on it. Then you have to design the house, with lots of drawings to show how it looks on the outside and where all the rooms will go inside. If I wanted to build my own house I would definitely need some help, but my cousin Scot can do it all! He is an expert woodworker, and he knows how to build a house. House design by Scot King. Here is one of my cousin Scot’s drawings, which shows a sort of see-through image of the outside and the inside. You can even see the foundations of the house that are underground. Scot does these drawings using a computer programme called Chief Architect. It allows him to look at the house from all different angles so he can spot mistakes before he gets working on site. 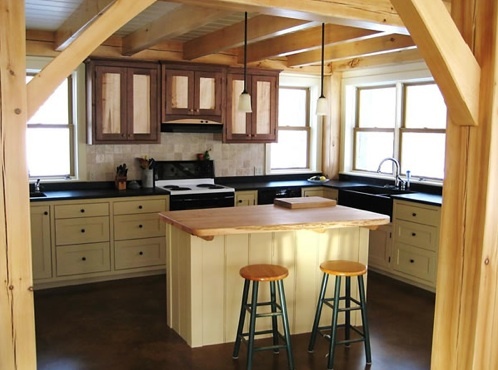 Traditional beams are cut to slot together, and wooden dowels hold them in place. 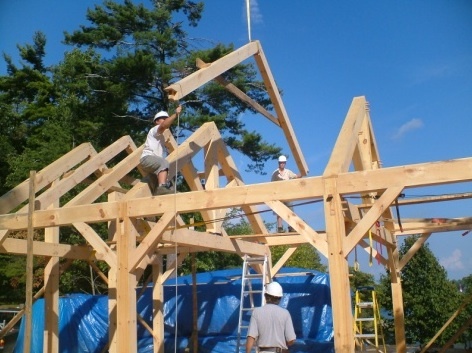 The house starts with concrete foundations and a wooden “skeleton”. 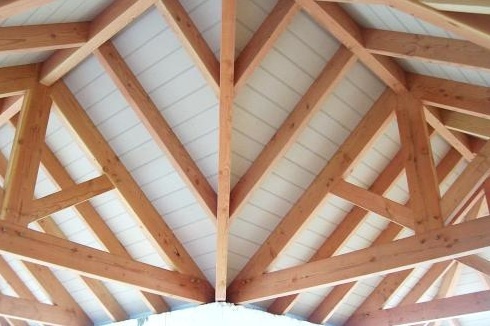 When they are in place, these same beams look beautiful and are part of the interior design. The wooden floor, staircases and counters are all hand-crafted, and my cousin can even make furniture! 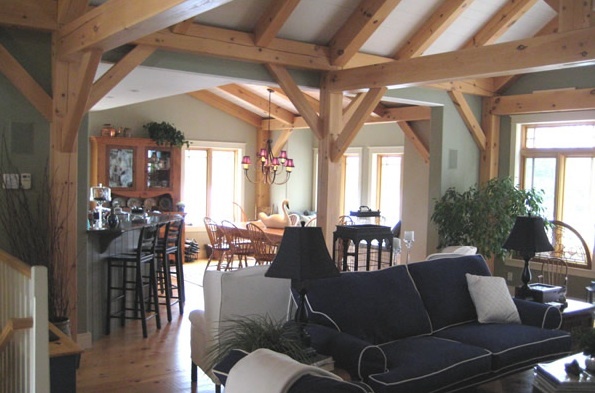 The structural beams are part of the rustic “look” of the finished house. The houses Scot builds are just as beautiful on the outside. 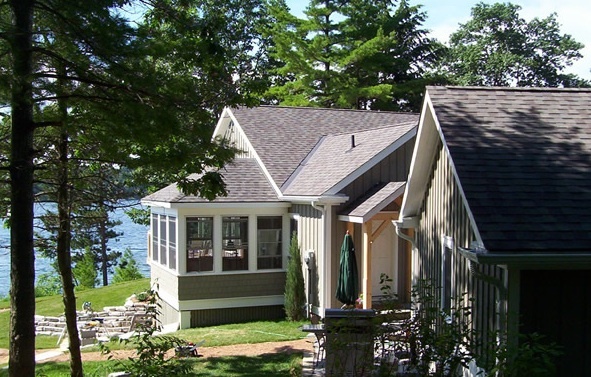 Often they are built on a waterside plot with tall trees, so they fit well into the natural setting. Some of these are summer cottages, and some are lived in all year round. House designed and built by Scot King. And the one below was designed for a member of the family. 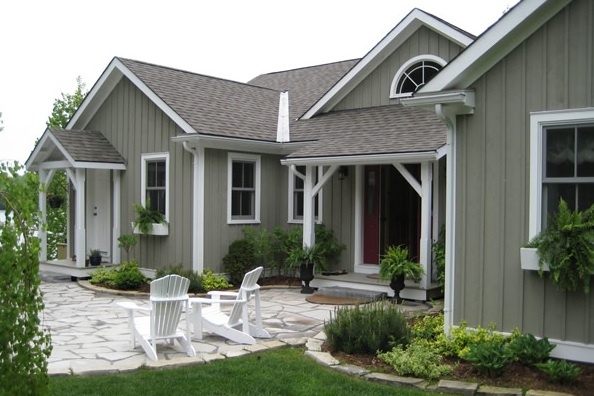 Sometimes I wish I lived in Canada so I could build my own dream house (with Scot’s help)! Scot has a company called Kingline Design and a great website (where I got all these pictures). It never ceases to amaze me that he can actually create something so big and complicated that you can actually live in! My cousin is one clever guy.